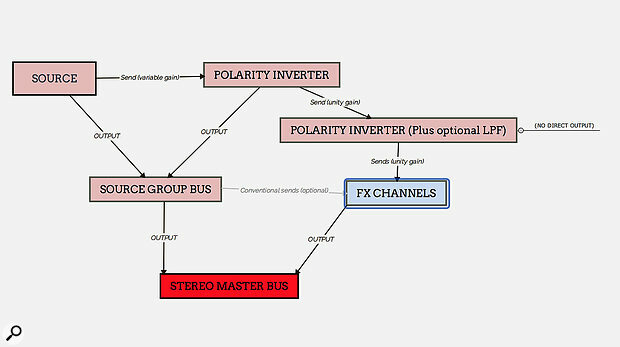 The basic signal routing to turn an aux send into an Echo Mixture-like facility: the source is sent to a polarity-inverted channel and the two are summed in a group bus; the polarity-inverted channel is sent to another channel to correct the polarity, and thence to the standard reverb send effect. 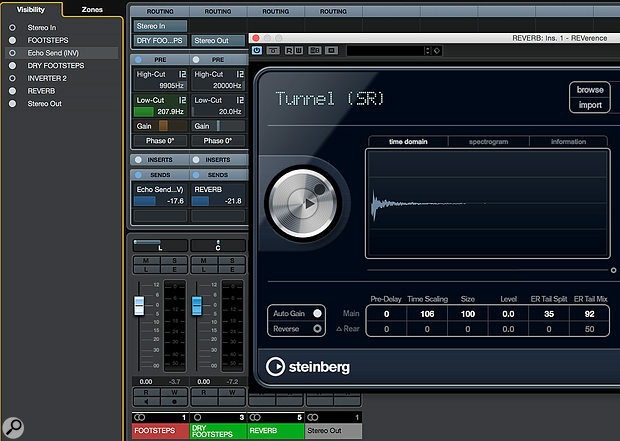 Turn your DAW’s aux sends into wet/dry blend controls that won’t raise the overall level of your signal. My esteemed SOS colleague Hugh Robjohns cut his engineering teeth at the BBC rather more years ago than he’d care for me to mention in public (let’s just say it was long enough ago that he can remember when the BBC spent handsomely on research and on specifying custom versions of audio gear for their own studios!). Recently — and I can’t recall quite how the subject first cropped up — he explained to me a console modification the BBC described as the ‘Echo Mixture’ control, and I was intrigued because I could see how useful it could be to me were it implemented in my DAW. What was this modification? Well, back in the 1970s, some BBC boffins had a really good idea: frustrated that the traditional aux-send approach to adding reverb not only makes the sound wetter but also makes it louder, they had their ‘general-purpose’ consoles (an understated name for desks commissioned from the likes of Calrec, Neve and Audix!) fitted with a non-standard control. The basic idea was that this control sent the channel’s signal to a reverb as usual but, as it did so, the dry sound was increasingly attenuated — so it functioned in a broadly similar way to the wet/dry blend controls we see on so many processors today. The critical difference between this and, say, a reverb’s wet/dry mix control is that the Echo Mixture still behaves like an aux send, so you can dial in a different blend setting for each source that’s sent to the reverb; by changing the wet/dry blend on the reverb unit you’d change the blend for all sources sent to it. Back in the day, radio producers could use this Echo Mixture control to make sounds appear to recede into the background, as if they were leaving the virtual stage, without the whole sound increasing in level, without swamping all the other sources, and without the engineer having to juggle multiple controls, but there’s no reason it couldn’t be used in music production too. For some reason, this neat facility seems largely to have been forgotten about, even though it would be trivially simple for a DAW developer to implement. Of course, we have plug-ins now, and modern machines offer enough computing power to insert reverbs on every source, so we could use the wet/dry blend controls on reverb plug-ins to achieve a similar effect. But that’s problematic: not only are computing resources still precious for many of us (whether due to our computers, more power-hungry modern plug-ins, or simply the high track count of many modern productions), but by switching to insert processing you lose one of the main benefits of aux sends, which is that different sounds can share the same virtual space. If you want to change that space you only need tweak one reverb instance if it’s configured as a send effect, whereas with inserts you’d need to tweak many — or at least find a way to link some parameters but not others (their wet/dry controls, for example, must remain unlinked). With all this in mind, I decided to figure out how to approximate the Echo Mixture control in any DAW. As it turned out to be fairly easy, I took things a step further, trying to incorporating other processes that are often applied to help simulate distance — things like low-pass filtering and, in relation to video in particular, variable audio delays. With such tweaks, I’ve found that my modern Echo Mixture setup can be really useful in all manner of audio projects, including music productions. Not only does it avoid that ‘swell’ that, love or loathe it, can result from sending a generous proportion of a sound to a reverb or delay but, in some circumstances, it offers a useful alternative to level automation, seemingly sending a sound back in the soundstage, leaving space for you to bring something else up front to capture the listener’s attention. There are, in fact, a couple of different ways to approach this in software, but I’ve been able to figure out only one basic method that works in any DAW. It takes advantage of phase-cancellation to attenuate the dry signal feeding the mix bus, while more of the dry signal is sent to the reverb plug-in. I’ll explain the routing that makes this possible further down the page but, before I do, it’s worth mentioning that some DAWs allow you to create controls which can manipulate multiple parameters simultaneously, and that it’s possible to use these to achieve pretty much the same result. And you could, if you wished, make creative use of a pan pot instead of the send controls I’ll use here. If you’re happy approaching things like that, that’s fine. However, I prefer to have the Echo Mixture controlled by the DAW’s aux send controls, because that way all sends (be they of the Echo Mixture variety or otherwise) are accessed from the same part of the DAW’s GUI, and hardware controllers won’t require custom mapping. All the channels set up in Cubase 8.5 Pro. You can still use your reverb as a regular aux-send effect — here, I’ve sent some of the Dry Footsteps group bus to the reverb directly, as well as the Footsteps source channel to the reverb via the Echo Mixture facility. 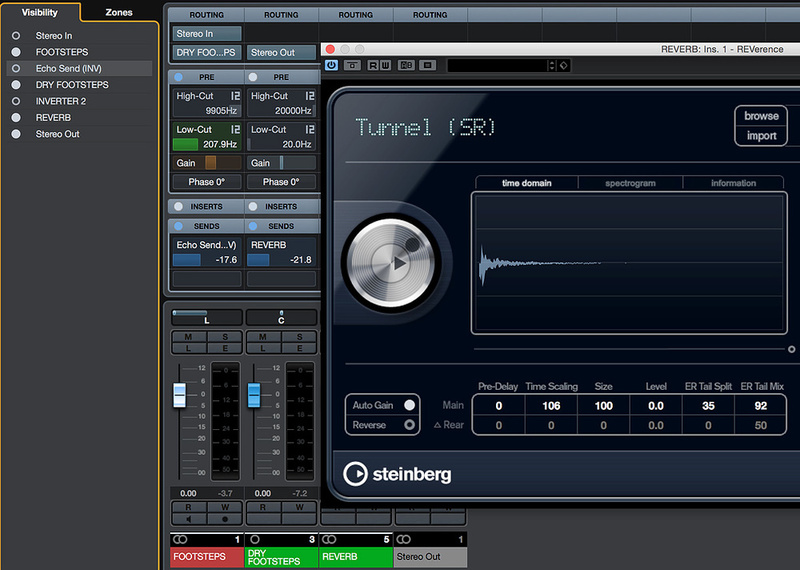 I’ve also applied filtering to the second inverting channel, so that the sound becomes darker as it is made wetter. The essence of the trick is to send the dry signal not directly to the reverb, but to a polarity-inverted channel. (See diagram above.) This channel is summed with the dry sound after the point at which the signal is sent to the reverb. The signal is sent at unity gain from the polarity-inverted channel to two destinations: one is the group bus, where the inverted signal is combined with the dry source, thus cancelling it in whole or in part (according to how much of the signal you sent); and the other is a second polarity-inverted channel which conveys the (now correct-polarity) signal on to the reverb at unity gain, but doesn’t feed the master bus directly. If you’ve kept up with the signal-flow description, you should be able to see that as you increase the send amount from the dry source channel, the reverb channel receives more signal, but increasingly less of the dry signal reaches the master bus — so we have our basic wet/dry control, with no increase in level. If your DAW has a visibility setting for individual channels, the Echo Mixture approach need not unduly clutter your mixer! Handily, the reverb channel itself isn’t affected in any way, and that means that you can route directly to it from the dry source’s group bus (if you route from the source channel directly, the reverb send isn’t attenuated along with the dry signal), or from any other channel in the usual way. So, for example, you might use the reverb with a regular send from the dry group bus to shape the overall sound, and then assign the same source via your Echo Mixture send to the same reverb to govern front-to-back movement. And as the filtering is applied within the Echo Mix signal chain rather than to the reverb itself, each sound for which you create an Echo Mixture send can be made as dark (wet) or bright (dry) as you wish. Of course, there’s nothing to stop you creating more than one Echo Mixture control per channel, each feeding a different effect. And one possibility this opens up is to have what I think of as depth-pan controls. 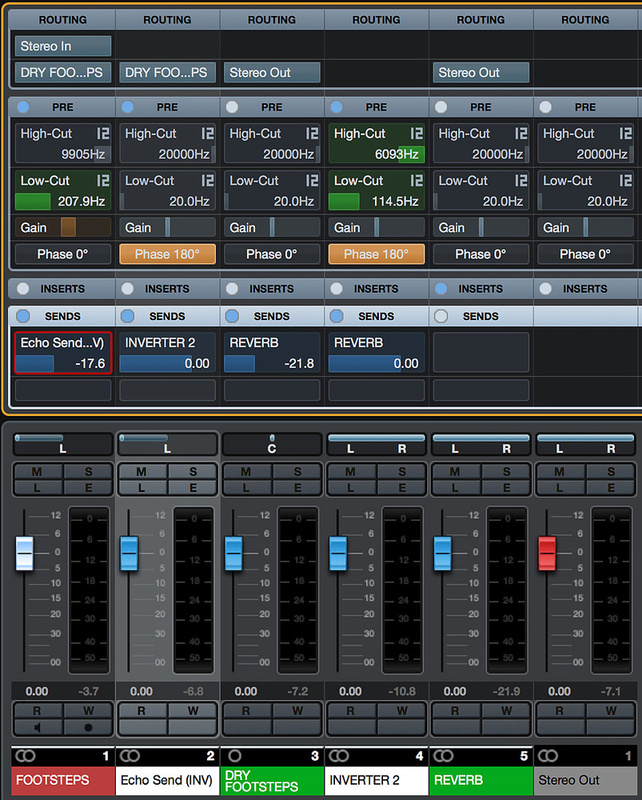 For example, set up three different sends as before, to a dual-channel reverb. Pan the Echo Mixture sends so that one is fully left, one centred, and the other fully right. Leave the source itself panned in the centre. Now, you effectively have ‘exit stage rear left’ and ‘exit stage rear right’ controls, which might be an interesting creative option in film or theatre sound. This all sounds far more complicated than it is in practice. It only takes 30 seconds to set an aux send up as an Echo Mixture control like this, and it’s even quicker if you create a project template with a few Echo Mixture channels. As most DAWs allow you to place tracks in folders or to show/hide them at will, it needn’t clutter up your screen either: once set up you can hide all but the source channel and, if you wish to use the reverb via a regular send effect too, the source group bus channel. So why not give it a try? 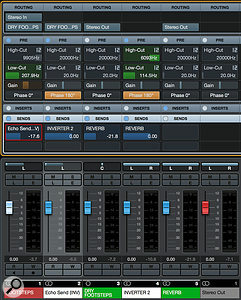 If you use Cockos Reaper, then note that, while the approach described in the main text will work just as it does in any other DAW, you have rather more options, courtesy of Reaper’s parameter modulation and flexible channel routing. In particular, this allows you to create a control that increases a delay time, which can make a sound seem more distant compared with a moving image. That said, there are limitations, due to the fact that parameter modulation only supports audio/MIDI signals and insert effects, but not in-built parameters such as the position of aux send and channel level controls. In a future article I’ll explain how, with a little lateral thinking, you can overcome these obstacles and modulate parameters according to your send control’s position.